For Halloween weekend, Tara and I decided to make the trip to Boston to visit our friend Sarah and reunite with one of our favorite cities! We hadn’t been to Boston for 4 years, and had wanted to visit Sarah while she was at BU, so what better weekend than Halloween!? Although we did spend a lot of time dressing up and socializing for the holiday, we were able to see some of our favorite Boston sites and explore some new ones. Our first day in Boston, we had to get lunch from Fanueil Hall so we headed in that direction to start our day. Since we hadn’t been there in so long, we had to stick to our favorites since we rarely get the chance to eat there. We’ve always loved the Chinese food they have and are even more obsessed with the Pina Colada smoothies from The Monkey Bar. Although pricey, totally worth it in my opinion! After, we went last minute Halloween shopping and then headed to Newbury Street. Although we could’ve taken the “T,” Boston’s public transit system, we decided to walk through Boston Common instead since the weather was perfect. Boston Common is just the huge park they have there and it was definitely the perfect scenic route to take to Newbury Street. On Newbury Street, there are tons of designer stores which are fun to peruse, and after shopping a bit, we stopped at Starbucks to get special Halloween Franken Frappuccinos. Basically, they’re Green Tea Frappuccinos with Peppermint and Java Chips… It was amazing! They totally put us in the Halloween spirit for a weekend of dressing up and Halloween parties ahead. Tara and I love dressing up for Halloween and tried to make creative costumes out of our limited budget. I had some old costume pieces hanging around from when I worked at a Halloween store, so I took the tutu and holograph leggings I had to become a Space Babe for Halloween night. I then added a NASA tee, silver lipstick, put my hair in two buns, and put a bunch of gems on my face to look like I could befriend an alien. Tara was a bookworm which involved a geeky look but a full on green outfit to make her look like a worm. My favorite part of her costume was her purse that had Catcher in the Rye on it! We also loved Sarah’s look… She was a shooting star! During our second day in Boston, it was pretty rainy, so Sarah’s roomie had the great suggestion of going to the Shops at Prudential Center. Along with a delicious lunch at the Cheesecake Factory, we shopped around, and went to the Top of the Hub to see an amazing view of all of Boston. 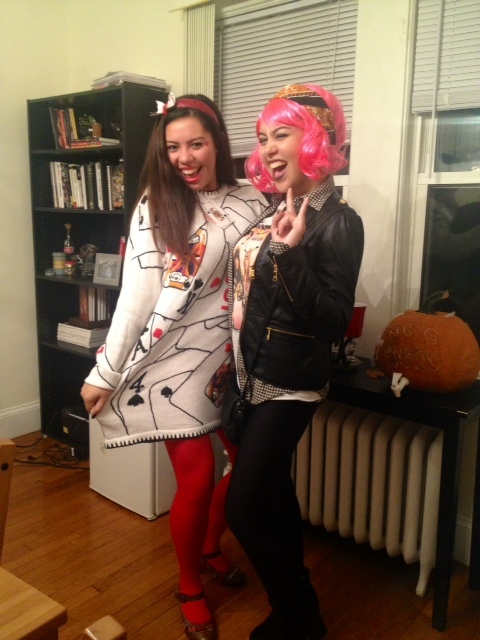 We then dressed up again that night and I went as a deck of cards, while Tara was a punk rocker. I had previously bought a dress covered in cards at a market in London, and was under the impression I could wear it in real life on any given day. I don’t really know what I was thinking because it has “costume” written all over it. I guess I wanted to come home from London with trendy street style, but it ended up being the perfect outfit to be a deck of cards! I then put some cards on a necklace and a headband to complete the look. For Tara’s punk look, she bought a crazy pink wig and put on MY shirt and flannel. She also made her own nose piercing out of a paperclip and wore black lipstick to be super edgy. We definitely chose a great weekend to go to Boston because not only did we get to explore the city, but it also was the perfect place to celebrate Halloween!